Well the official figures are out. 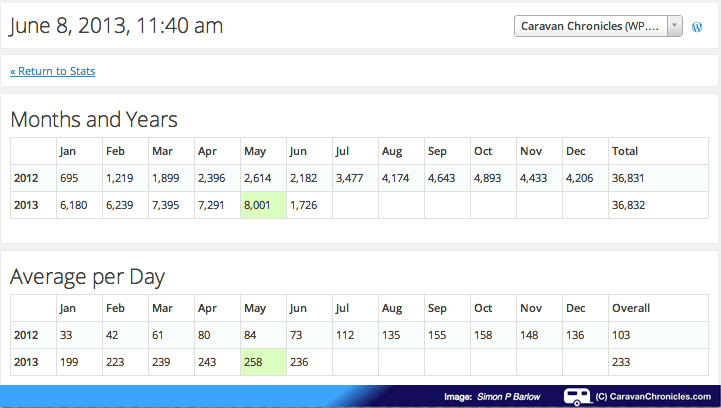 The WordPress.com stats helper monkeys prepared a 2014 annual report for Caravan Chronicles and it’s been a bumper year for the UK’s most popular caravanning blog. Thank you to everyone that has followed, commented and blogged. Sue and I are looking forward to 2015 when hopefully we can bring you even more. The Louvre Museum has 8.5 million visitors per year. This blog was viewed about 330,000 times in 2014. If it were an exhibit at the Louvre Museum, it would take about 14 days for that many people to see it. Caravan Chronicles now on Facebook too! So if you have an urge to click “like” on Facebook… just make sure is Caravan Chronicles! PS… Not a clue how this is going to work out, so you might have to be patient! The WordPress.com stats helper monkeys prepared a 2013 annual report for Caravan Chronicles – one of the fastest growing blogs in caravanning & travel in 2013. We’ve beaten last years views already! 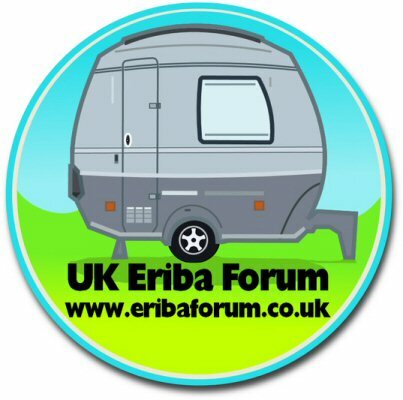 Many thanks to all that have visited and especially those that have commented, rated posts, tweeted and linked some of my pages to Facebook and caravanning forums. Here’s hoping I can double last years figures before the year-end. No I don’t mean the football club! Last September we had a fantastic 5 nights at Newberry Valley campsite in Combe Martin, North Devon (You can read about it in “Camping With Wolves“). The camp site is at one end of the small valley and at the other end is The Wolf Centre run by TV personality Shaun Ellis…. “The Wolf Man”. It would now seem though that The Wolf Centre is under threat from the planning department and there is a fear that there may be a possibility that if permission is refused the centre will have to close and the fate of the wolves is unknown. 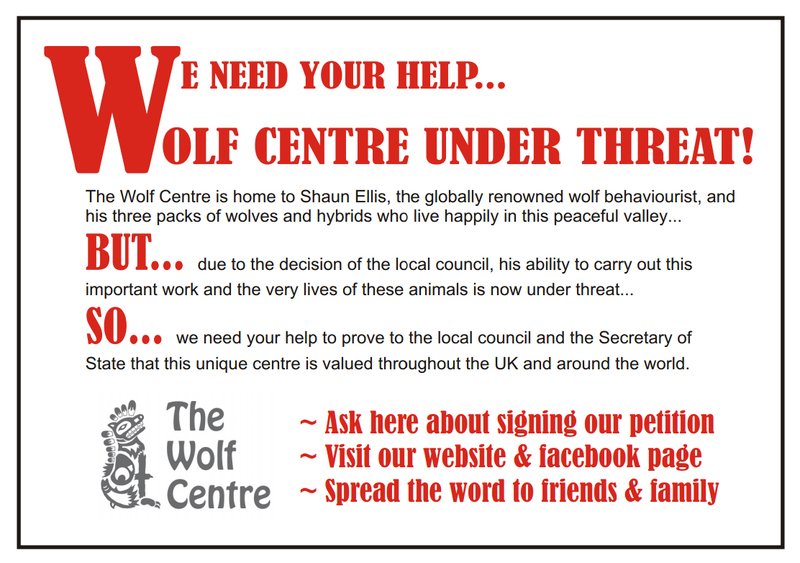 There is an online petition that you can sign to help support Shaun and the wolves. There has been a lot of press coverage in the Daily Mail and Guardian newspapers but every signature helps. I’ve been pondering on adding a map for a couple of weeks. Somehow looking at where you have been on a map is a bit more memorable and interesting than just looking down a list, well for me it is. I guess though that’s due to the fact that flying and maps are so intertwined I’ve spent so much time in the past pouring over maps for flying in various parts of the world than I have ever done caravanning. Actually creating the map was fairly easy using Google Maps and then embedding the map in an iframe in the WordPress page. The only thing that you need to do is create a Google account if you don’t already have one and create your own map and start adding the map pins. There is a lot of useful info to be found on the Google Maps support page. For embedding it into your WordPress theme, it’s quite simple and its all explained on the WordPress support page for Google Maps. Anyway, if you want to look at this marvellous cartographical creation… the link is on the top menu bar…. 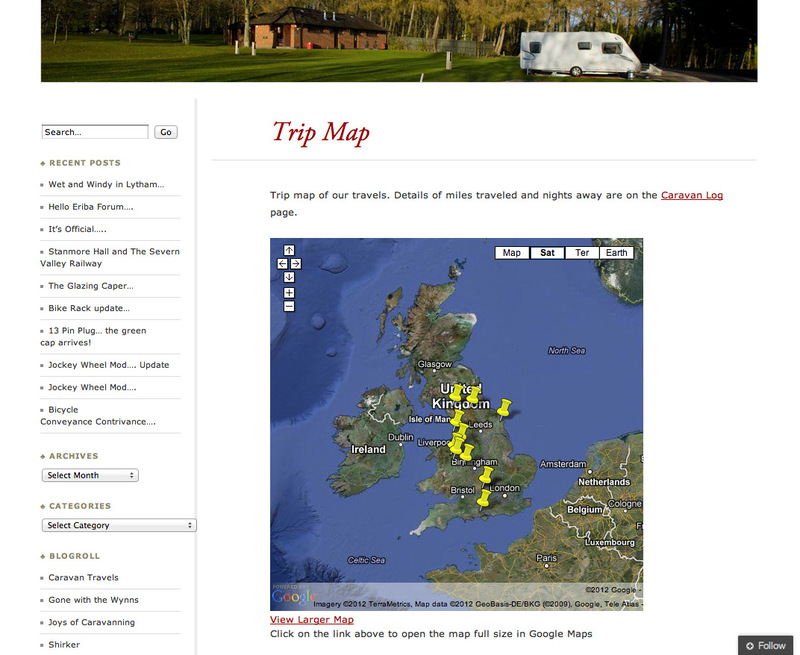 or you can just click on Trip Map.